There were some survivors scattered throughout the Middle East and Transcaucasia. Thousands of them, refugees here and there, were to die of starvation, epidemics, and exposure. Even the memory of the nation was intended for obliteration. The former existence of Armenians in Turkey was denied. Maps and history were rewritten. Churches, schools, and cultural monuments were desecrated and misnamed. Small children, snatched from their parents, were renamed and farmed out to be raised as Turks. The Turks “annexed” ancestors of the area in ancient times to claim falsely, by such deception, that they inhabited this region from ancient days. A small remnant of the Armenian homeland remained devastated by war and populated largely by starving refugees, only to be subsequently overrun by the Bolshevik Red Army and incorporated into the Soviet Union for seven decades, until its breakup in 1990. The word ” genocide” had not yet been coined. Nonetheless, at the time, many governmental spokesmen and statesmen decried the mass murder of the Armenians as crimes against humanity, and murder of a nation. Reports of the atrocities gradually came out and were eventually disseminated the world over by newspapers, journals, and eyewitness accounts. In the United States a number of prominent leaders and organizations established fundraising drives for the remnants of the “Starving Armenians”. In Europe the Allied Powers gave public notice that they would hold personally responsible all members of the Turkish government and others who had planned or participated in the massacres. Yet, within a few years, these same governments and statesmen turned away from the Armenians in total disregard of their pledges. Soon the Armenian genocide had become the “Forgotten Genocide”. The Genocide Monument is designed to memorialize the innocent victims of this first genocide of the 20th century. The Genocide Museum teaches that understanding the Armenian Genocide is an important step in preventing similar tragedies in the future, and that those who forget the past are condemned to repeat it. I have conducted a series of conversations with competent and influential Turkish personages, and these are my impressions: A large segment of the Ittahadist [Young Turk] party maintains the viewpoint that the Turkish empire should be based only on the principle of Islam and Pan-Turkism. Its non-Muslim and non-Turkish inhabitants should either be forcibly islamized, or otherwise they ought to be destroyed. These gentlemen believe that the time is propitious for the realization of this plan. The first item on this agenda concerns the liquidation of the Armenians. Ittihad will dangle before the eyes of the allies the specter of an alleged revolution prepared by the Armenian Dashnak party. Moreover local incidents of social unrest and acts of Armenian self-defense will deliberately be provoked and inflated and will be used as pretexts to effect the deportations. Once en route however, the convoys will be attacked and exterminated by Kurdish and Turkish brigands, and in part by gendarmes, who will be instigated for that purpose by Ittihad. The Armenian Genocide was carried out by the “Young Turk” government of the Ottoman Empire in 1915-1916 (with subsidiaries to 1922-23). 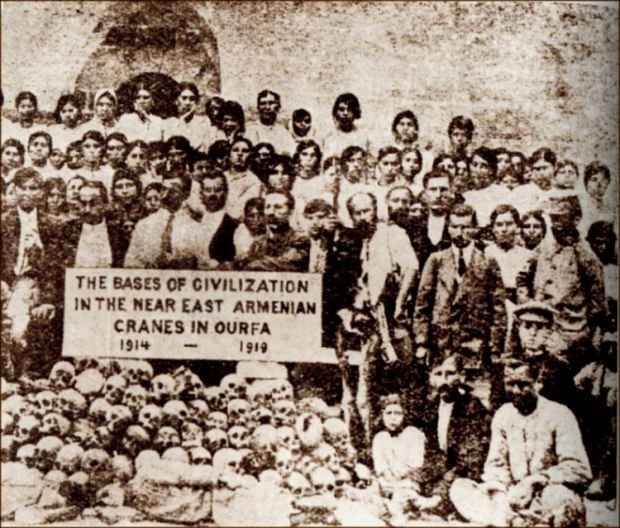 One and a half million Armenians were killed, out of a total of two and a half million Armenians in the Ottoman Empire. The Armenian Genocide was masterminded by the Central Committee of the Young Turk Party (Committee for Union and Progress [Ittihad ve Terakki Cemiyet, in Turkish]) which was dominated by Mehmed Talât [Pasha], Ismail Enver [Pasha], and Ahmed Djemal [Pasha]. They were a racist group whose ideology was articulated by Zia Gökalp, Dr. Mehmed Nazim, and Dr. Behaeddin Shakir. The Armenian Genocide was condemned at the time by representatives of the British, French, Russian, German, and Austrian governments—namely all the major Powers. The first three were foes of the Ottoman Empire, the latter two, allies of the Ottoman Empire. The United States, neutral towards the Ottoman Empire, also condemned the Armenian Genocide and was the chief spokesman in behalf of the Armenians. The Permanent People’s Tribunal recognized the Armenian Genocide on April 16, 1984. The European Parliament voted to recognize the Armenian Genocide on June 18, 1987. President Clinton issued a news release on April 24, 1994, to commemorate the “tragedy” that befell the Armenians in 1915. The Russian Duma (the lower house of the bicameral Russian legislature) voted on April 20, 1994, to recognize the Armenian Genocide. The Armenian genocide is similar to the Jewish holocaust in many respects. Both people adhere to an ancient religion. Both were religious minorities of their respective states. Both have a history of persecution. Both have new democracies. Both are surrounded by enemies. Both are talented and creative minorities who have been persecuted out of envy and obscurantism. – The Republic of Turkey must cease to be the only major country in the world to deny the Armenian Genocide. – The Republic of Turkey must show good will by allowing American aid to present-day Armenia to pass through unhindered. – The Republic of Turkey must cease to train Azerbaijani soldiers in Turkey for the purpose of attacking Armenia.